Trang is a Physiotherapist who graduated from La Trobe University and joined the team in October 2018. Trang is a passionate and outgoing person who also has her own Personal Training business. 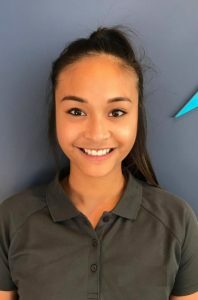 Her combination of Physiotherapy and Personal Training knowledge means that she is very interested in assessing, diagnosing and treating musculoskeletal pains and injuries. Trang has also had experience in acute hospital wards and in women’s health for pre and post natal care. She offers ‘hands on’ and dry-needling treatment, and is great with exercise rehab for pain-free function and optimal posture and movement. In her own time, Trang does her own training in weightlifting and long-distance running. She also plays indoor soccer where there is probably more talking and laughing than goal-scoring from her end. Trang is driven to alleviate any of your niggles and pains to provide the best care possible. She envisions to help enhance your recovery and encourage self-management for long-term results and quality of life.